Comedy Central has entered into an agreement with 20th Century Fox Television to syndicate the existing episodes and air the new movies as new episodes in an episodic format as of February 2008. 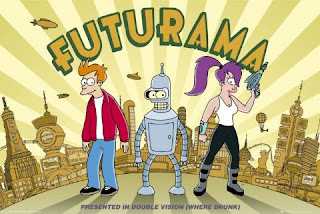 At Comic-Con 2007 it was announced that Futurama will return on November 27th as a full-length DVD release called Futurama: Bender's Big Score, which will be followed by three additional films: The Beast with a Million Backs, Bender's Game and Into the Wild Green Yonder. After their release, each film will be divided into four episodes and air on Comedy Central. The show originally aired from 1999-2003 on FOX but was constantly pre-empted by Football... glad to see the show return as Family Guy has as well as King of the Hill!